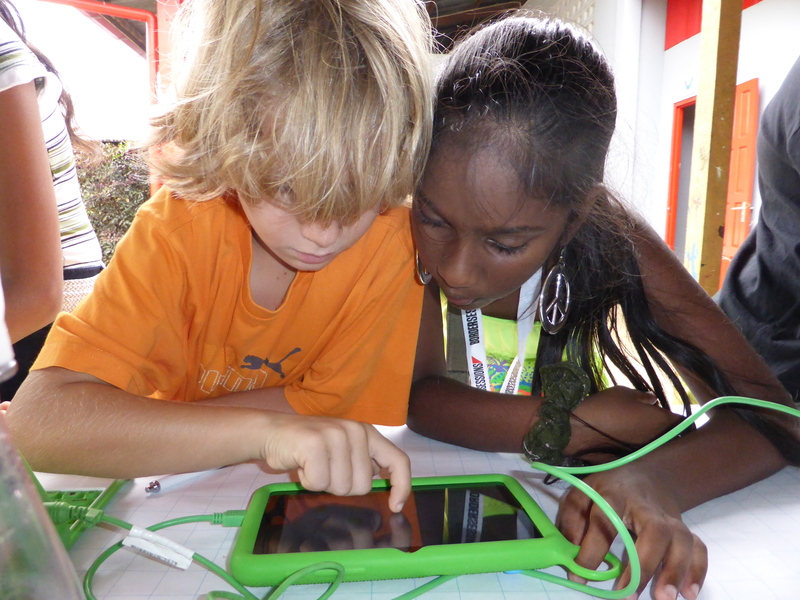 Review of the OLPC XO Tablet; Appreciated by children, full of interesting apps, but where is the backing by the One Laptop Per Child organization? Great to have a successor to the One Laptop Per Child laptop. Funny to have it loaded with 200 selected Spanish/English apps for playful learning, ordered into 15 dreams (future professions). Interesting the effort to offer a shell for parental / teacher control and creating accounts, setting specific options like internet acces on/off, monitoring roughly the activities and interests of the children. The hardware apparently comes from various suppliers with minor differences. It is not crowded with innovations like the OLPC laptop once was; in fact it is an average Android tablet packaged in a green protection band. My personal experience: children in both developed and developing countries liked it. It looks and feels for them as “a tablet for us”. The many apps are new and full of surprises and different from the apps everybody has on their smartphones already. Tip: switch off the internet access and they have a great time. Fifteen dreams: Artist, Astronaut, Athlete, Chef, Doctor, Engineer, Green, Mathematician, Musician, Photographer, Programmer, Scientist, Teacher, Traveller, Writer. What worries me: the organization behind the One Laptop Per Child project which was already talking about this tablet before the iPad even existed, now launched it, sells it via Amazon, Target, and Walmart, and further, I hear nothing more from them. I did not hear about projects in developing countries based on the tablet. There is no background material on their site, nor on the sites of the producers, like Vivitar. The XO Tablet site does not even mention OLPC at all. Huperlinks to its promotion video (! ), and to the shops of Target and Walmart are obsolete. The dreams (future professions) are based on developed countries, the guidance mechanism is for parents more than teachers. There is no documentation on how to add new dreams or add extra apps in the dream-structure. Technical support is absent, a user community also. Nice that the prices are falling rapidly. Does this mean the OLPC dream is over? Perhaps another case of throwing out a shiny product with shiny software thinking it has universal relevance. Why not equip parents, teachers and kids to “create” dreams using an app? How about farmer, businessperson, etc.? Many young adults in developing countries get into some kind of small business — and sometimes make it big! It’s also important to promote agriculture — it’s a problem that young adults don’t like to get into this although there’s a big need.